British consul-general to Chile; born in Dublin 1824; died in London Feb. 28, 1899. He was educated at Bristol; in May, 1861, was appointed unpaid British vice-consul at Cobija; and from Sept., 1863, to June, 1866, was acting French consul there. In 1867 he was for a short time acting chargé d'affaires at Caracas, and in the following year was named commissioner in the mixed British and Venezuelan commission for the settlement of British claims against the government of Venezuela. In 1869 Joel was again acting chargé d'affaires as well as consul-general at Caracas, and in the following year was promoted to be consul at Rosario, a position which he occupied for seven years. Subsequently he became consul successively at Brindisi, Italy; Georgia, U. S.; and Cadiz, Spain; and he was then promoted to be consul general for the departments of Panama, Bolivar, Magdalena, and Cauca. Later on Joel became consul-general to Chile, and had charge of the legation of Santiago, from which he retired on a pension in Jan., 1894. 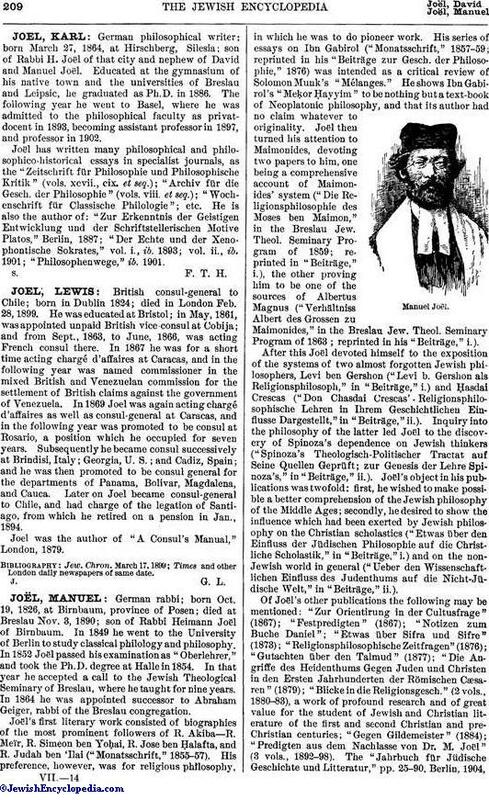 Joel was the author of "A Consul's Manual," London, 1879. Times and other London daily newspapers of same date.